The recent announcement of “Advisory Brigades” by Army Chief of Staff Gen. Mark A. Milley focuses on the need for specialized units to train and advise foreign forces. Called train, advise and assist brigades, the units would deploy to different combatant command areas to help train allies and partners, similar to what units have been doing in Iraq and Afghanistan. “I look at it as if you get a two-for,” Milley said. “You get a day-to-day engagement that the combatant commanders want in order to train, advise and assist. And then in time of national emergency, you have at least four or five brigades with standing chains of command that can marry Soldiers up like the old COHORT units. A complex relationship exists among security cooperation, security assistance, and the military instrument of foreign internal defense. 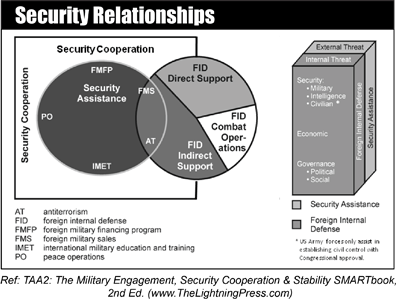 The left side of the illustration below depicts this relationship, including how aspects of foreign internal defense and security assistance overlap. The right side illustrates how foreign internal defense focuses on internal threats to a host nation and how security assistance focuses on external threats. The column depicts how security (military, intelligence, and civilian), economic, and governance are considerations common to both foreign internal defense and security assistance. Security Force Assistance supports the military instrument of foreign internal defense, much of security assistance efforts, and some security cooperation efforts. Military engagement, security cooperation, and stability missions, tasks, and actions encompass a wide range of actions where the military instrument of national power is tasked to support OGAs and cooperate with IGOs (e.g., UN, NATO) and other countries to protect and enhance national security interests, deter conflict, and set conditions for future contingency operations. Use of joint capabilities in these and related activities such as Security Force Assistance and Foreign Internal Defense helps shape the operational environment and keep the day-to-day tensions between nations or groups below the threshold of armed conflict while maintaining US global influence. Security cooperation is all Department of Defense interactions with foreign defense establishments to build defense relationships that promote specific United States security interests, develop allied and friendly military capabilities for self-defense and multinational operations, and provide United States forces with peacetime and contingency access to a host nation. Security cooperation aims to promote stability, develop alliances, and gain and maintain access through security relationships that build both partner capacities and capabilities. The capacities and capabilities of partners directly correlate to the type of activities undertaken. Goals range from creating a positive relationship that allows freedom of movement to creating global security interoperability with core partners to addressing regional security organizations and alliance organizations. A broad range of interconnected and integrated security cooperation activities accomplishes security cooperation. 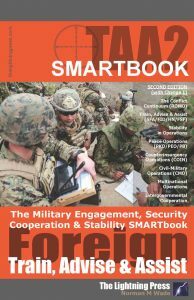 Security cooperation primarily focuses on interoperability programs with both core partners and the fledging security forces of a failed or failing host nation. Military forces use security cooperation efforts to achieve mid- to long-term objectives with partners. Although forces may require short-term activities, they take extreme care not to put long-term objectives, nationally and regionally, at risk. The size of security cooperation offices vary from country to country based on the size and complexity of the security cooperation program to achieve the joint force commander and country team objectives. The Army supports security cooperation through security assistance, security force assistance, foreign internal defense, and security sector reform. Security assistance is a group of programs authorized by the Foreign Assistance Act of 1961, the Arms Export Control Act of 1976, or other related statutes. These programs permit the United States to provide defense articles, military training, and other defense-related services by grant, loan, credit, or cash sales in furtherance of national policies and objectives. Security force assistance is Department of Defense activities that contribute to unified action by the United States Government to support the development of the capacity and capability of foreign security forces and their supporting institutions (JP 3-22). Military forces conduct these activities facilitating host nations to deter and defend against transnational internal threats to stability. The DOD also conducts security force assistance to assist host nations to defend against external threats; contribute to coalition operations; or organize, train, equip, and advise another country’s security forces or supporting institutions. The only security force assistance activity conducted under combat conditions is combat advising. Security sector reform (SSR) is an umbrella term that discusses reforming the security of an area. SSR includes integrated activities in support of defense and armed forces reform; civilian management and oversight; justice, police, corrections, and intelligence reform; national security planning and strategy support; border management; disarmament, demobilization, and reintegration; or reduction of armed violence. In SSR, the Army primarily supports reforming, restructuring, or reestablishing the armed forces and the defense sector across the range of military of operations. Within the range of military operations, nation assistance (NA) is civil or military assistance (other than foreign humanitarian assistance [FHA]) rendered to a nation by US forces within that nation’s territory during peacetime, crises or emergencies, or war, based on agreements mutually concluded between the United States and that nation. NA operations support the host nation (HN) by promoting sustainable development and growth of responsive institutions. The goal is to promote long-term regional stability. NA programs include security assistance (SA), humanitarian and civic assistance (HCA), and foreign internal defense (FID). FID is the participation by civilian and military agencies of a government in any of the action programs taken by another government or other designated organization, to free and protect its society from subversion, lawlessness, insurgency, terrorism, and other threats to their security. Internal threats in the context of this publication means threats manifested within the internationally recognized boundaries of a nation. These threats can come from, but are not limited to, subversion, insurgency (including support to insurgency), and/or criminal activities.